Yesterday I made a hamburger made with 90% lean ground organic beef from Whole Foods Market in Santa Cruz. I mixed about a 1/4 lb of meat with a teaspoon of chopped garlic, salt, and pepper. I heated a skillet with some oil in it and added my patty to the pan. While the first side of the burger was cooking I sliced some pineapple and half of a Bacon avocado. A Bacon avocado is a variety of avocado with a smooth green skin and smaller than a Hass. It has a slight bacon flavor, hence the name. I can’t find them in the grocery store, but they are available around here at farmer’s markets and road side produce stands. After cooking one side of the burger for about six minutes I flipped it over and added the pineapple to the pan. I put some hoisin sauce on top of the burger. I toasted a whole wheat bun in the toaster. 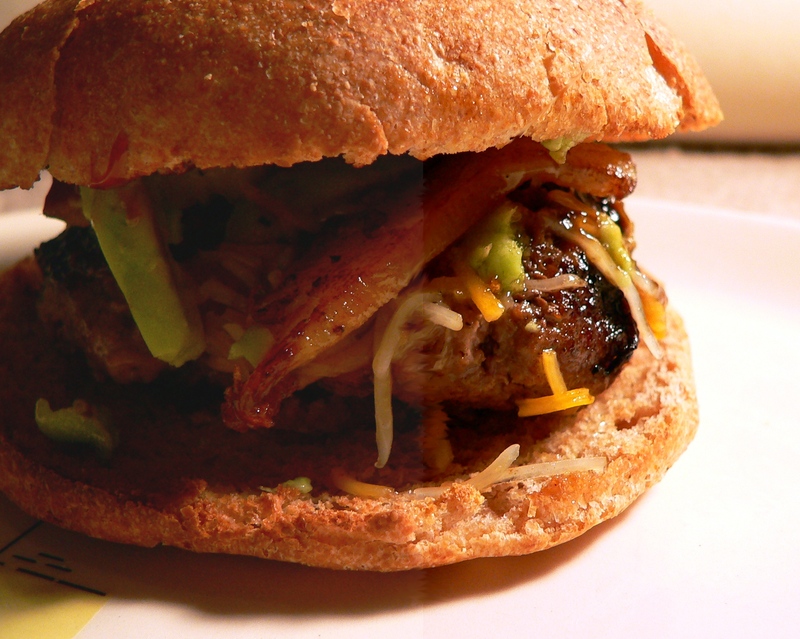 After toasting the bun I spread hoisin sauce on the top bun, then added the avocado and pineapple. To finish the hamburger off I sprinkled a little cheese on top. In all, I cooked the burger to about medium (six minutes on each side). It was very tasty, but I had a hard time eating because I have bell’s palsy right now. I had to take a knife and fork to it. Andrew and I had a stalemate over what to cook for dinner the other night. We both get incredibly irritable when we’re hungry. We sat in silence for a good ten minutes after he shut down my pierogi dinner idea before we realized that we were being stupid and that we should go to the grocery to decide what to cook for dinner. We went to Whole Foods and ended up with two Mahi Mahi filets (fish is on sale because of Lent), pineapple, and red potatoes. I added salt, pepper, and chopped garlic to the non-skin side of each filet. I heated a medium sized skillet to medium, sprayed with cooking oil, and added each filet skin side down. Then I glazed mine in hoisin sauce (Andrew took one whiff of it and wanted to vomit). After about seven minutes I added the pineapple and put a lid over the fish to cook the tops. Before cooking the fish I washed and diced the potatoes, put them in a baking dish with salt, pepper, garlic, and olive oil spray and cooked them for about twenty-five minutes at 375°. The fish was flakey, moist, and tasted great. The pineapple really added a wonderful touch. I would definitely cook something like this again. Wednesdays are my short work days. School gets out around twelve thirty and then I don’t work with my next client until 4:15. This leaves me with a nice gap to cook lunch instead of just grabbing a bagel and a banana or a bowl of cereal like I do on Monday, Tuesday, and Thursday. Today I decided to make use of another turkey cutlet and some ramen. Ramen is the poor, single person’s best friend. It is versatile, cheap, and quick. It’s also not completely bad for you if you don’t use the flavor packet (which is disgusting in my opinion). I felt that I needed something green to go along with it so I pulled out some green leaf lettuce. 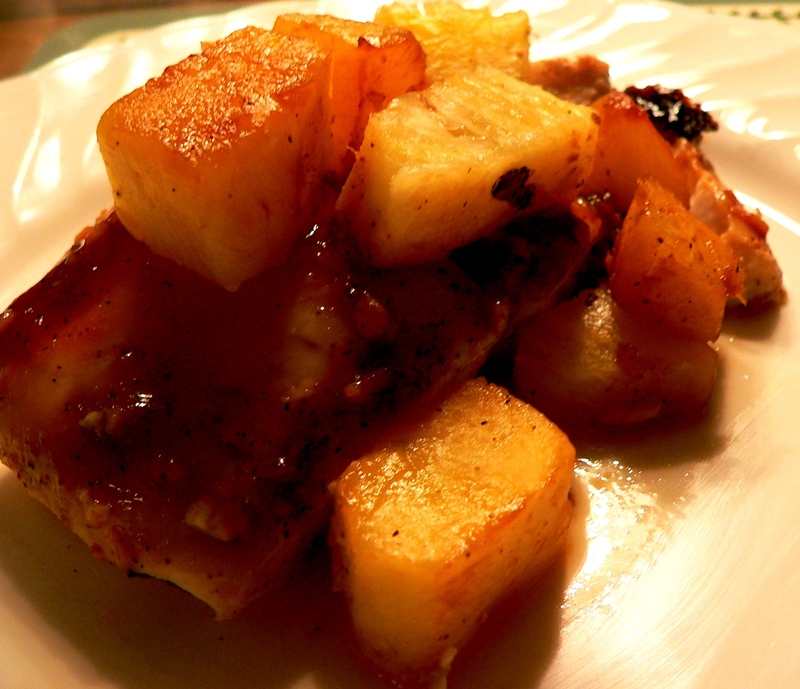 It added some nice color, crunch, and freshness to the dish. This time around I did not end up overthawing my turkey cutlet in the microwave, therfore drying it out. This time around it was fresh and moist. While my turkey cutlet was defrosting in the microwave, I put a pot of water on to boil. Then I heated up a non-stick skillet with some oil spray. I seasoned the turkey cutlet with salt and pepper. I put it in the pan on medium heat and then added some chopped garlic to the pan. I have to say that pre-chopped garlic in a jar is one of the greatest things ever. After cooking the turkey on one side for about three minutes or so, I flipped it over to cook on the other side. Then I added my ramen noodles to the boiling water. The turkey was done by the time the noodles were done cooking. 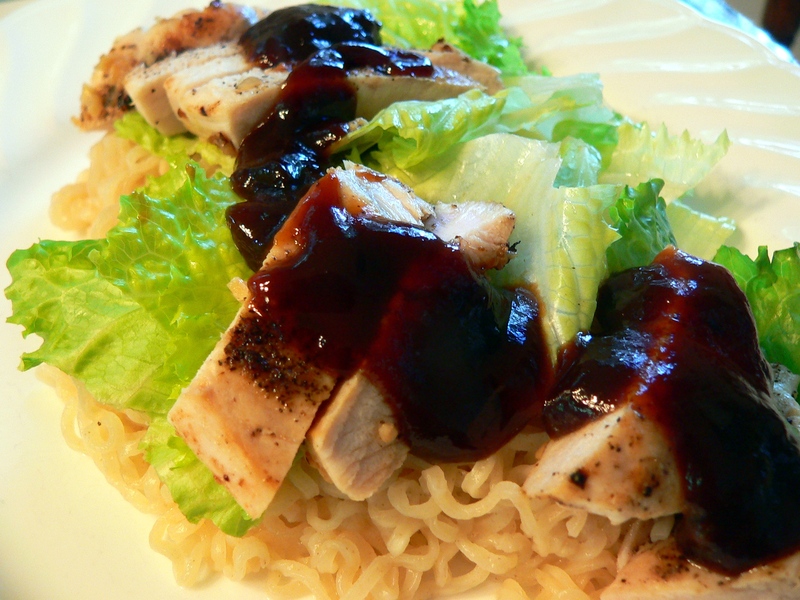 I completely drained the noodles, chopped up some green leaf lettuce, sliced the turkey, and piled it on the plate with some hoisin sauce to top it off. 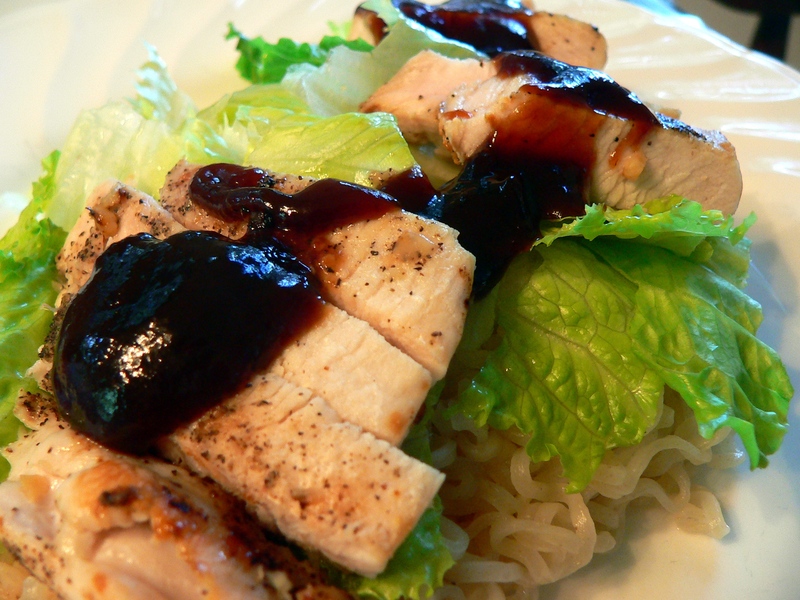 I forgot how damn delicious hoisin sauce is. It was a great meal.